We sell antique English and American barometers of all types: banjo or wheel, stick, aneroid, marine, pocket and barographs. We have the largest selection of barometers in New England! Open all year by chance or appointment. We always have many items that are fresh to the market. When visiting Maine, be sure to bring your broken barometer to us for a free estimate of repair and valuation. Many repairs can be done promptly while you enjoy Maine. Various parts are available. Hand delivery is available to many areas of the continental United States. 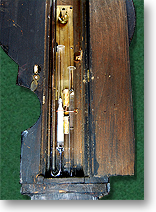 The barometer was first invented by Evangelista Toricelli of Florence Italy in 1643. This was basically a stick barometer and was introduced in England by Robert Boyle about 1660. He added scales to read the height of the column of mercury. In 1663 the wheel or banjo barometer was invented by Robert Hooke. Barometers were first made for domestic use about 1670. Nothing survives from these early times and very little of eighteenth century manufacture is on the market today. There are many beautiful barometers available starting about 1800 and thru the nineteenth century. Wheel or "Banjo" Barometers are mercury column barometers operating with a "J" tube as shown in the picture. These are properly called wheel barometers. They have also been nicknamed banjo barometers due to their shape. The hand on the dial is moved by the float in the mercury column rising and falling with changes in air pressure. The float is tied on a string that goes over the wheel and is held taught by a counterweight. As the wheel turns, the black hand is moved over the dial giving the reading. 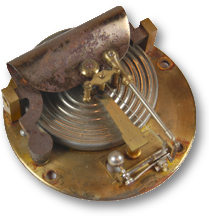 The other hand (brass) is moved by turning the knob below the dial or the knob mounted on the glass. This is a memory crutch so that you can see the change in pressure. Stick barometers were made in many styles during the eighteenth and nineteenth century in England and other countries. In the early 1800's they were made here in America and became very popular about the 1850's. They are read by observing the height of the column relative to a scale. There is usually a vernier scale that slides up and down on the main scale to use for a memory crutch and to enable you to read the scale more accurately. Aneroid (Greek for "without liquid") barometers were invented in 1843 by Lucien Vidie in France and have a mechanical movement to show changes in barometric pressure. They are sometimes called Holosteric (wholly solid) barometers. These were made extensively in France and also in England and the same basic movement is made today for modern barometers.